We are small hobby breeders and our kittens are registered with the GCCF. We now have our prefix... Raguccisnowdols. We have been to the cat seminars... which are very educational and eye opening, which we really enjoy. My name is Joanne, I live with my partner Jordan. I am a carer for my father. 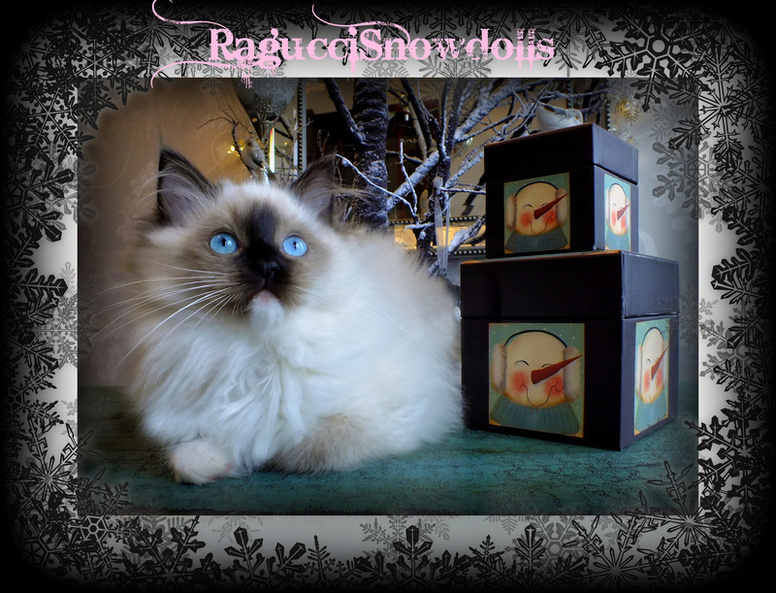 We are based in Leicester, Leicestershire, where we live happily with our small family of Ragdolls. All our Ragdolls are first and foremost our much loved pets. They all live indoors with us, they have the run of our house and are raised as part of our family. 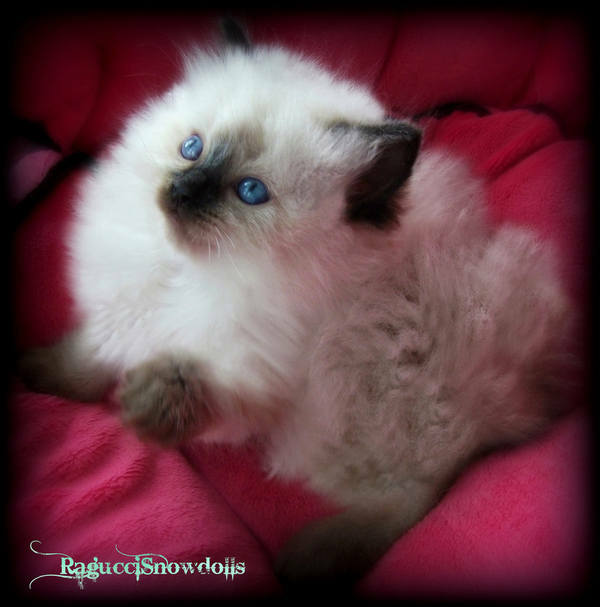 I purchased my first Gccf Registered Ragdoll as a pet, Twilight, Beautiful natured Raggy. I couldn't believe how different he was to your usual moggy, I have had cats all my life, but none were like this breed. My daughter and I fell totally in love with him. Twilight was my inspiration to look into becoming a registered breeder. These babies have changed our life's forever, it is a very rewarding and enjoyable hobby... we occasionally have kittens. RAGDOLLS ARE STRICTLY INDOOR CATS ONLY!! Due to their nature, as they are so laid back and trusting they have no concept of danger! I put in alot of time and effort into my cats for them to be HAPPY & SAFE, my aim is to provide healthy beautiful happy contented ragdoll temperment kittens. PLEASE don't ask to purchase a kitten, if it is going to be left alone at home all day. These kittens are not like your usual moggy, they do not adapt well to being on their own. The kitten will become Very Depressed and Lonely, which could make him/her ill. If sometimes you are not in dueing the day,it is recommend two kittens, for company or another feline so they don't become Bored and Lonely. As kittens get older they can have exercise and fresh air in your back garden, if it is secure and they are Supervised. You could have a cat run outside, for them to play and get fresh air for a couple of hours when it is nice weather, but by no means do i want any of my kittens caged outside permanently. This destroys their personalitys and is a very SAD, FRUSTRATING, LONELY LIFE! Ragdolls crave human company, and company off other felines. I ONLY SELL KITTENS TO, STRICTLY INDOOR HOMES ONLY!! I am always here to answer any questions, and to give help and advice to anyone who is interested or purchases our kittens . My eldest cat is a male Persian, 15 years old .. 2009. PLEASE FEEL FREE TO LOOK ROUND THE REST OF MY SITE.